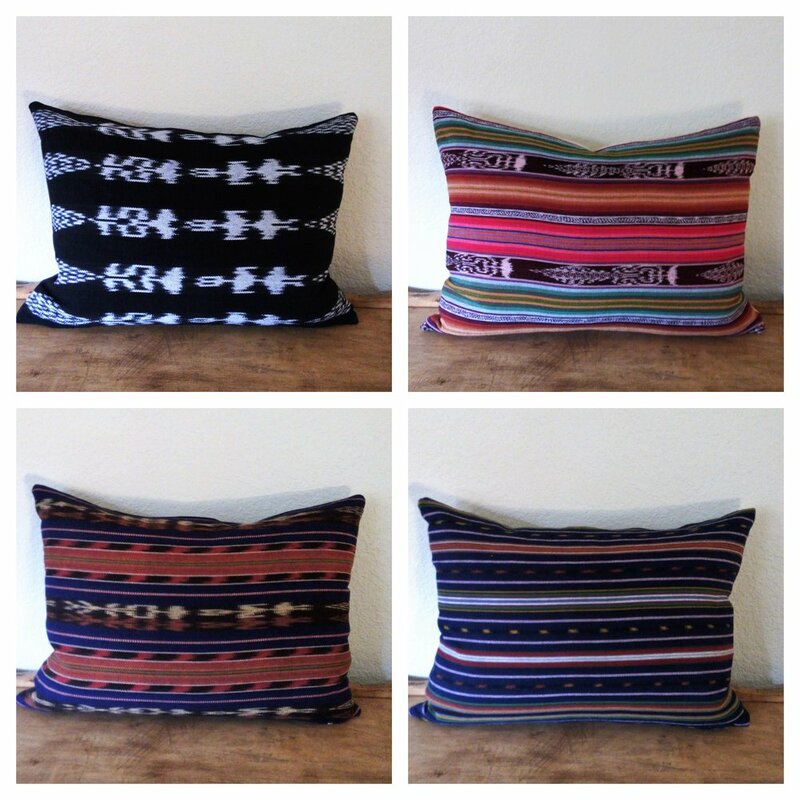 Pillow covers are available for in-person purchase at Vintage Bleu in downtown Denton, or for online purchase to be shipped to you. To order a pillow cover, please send a message with the the cover, color, and size you are interested in, and we can complete the transaction via PayPal or check. Please allow 1-2 weeks for the pillows to be ready for shipping. Feather/down inserts are available for in-store purchase, but are not available for shipping (a 20” x 20” insert fits the 18” x 18” covers, and a 14” x 20” insert fits the 14” x 20” covers). A soft, but sturdy cotton/linen blend with pinstripes. Constructed with an invisible zipper. Wash and dry medium. Woven cotton large-scale buffalo check. Constructed with an invisible zipper. Wash and dry medium. Fair-trade hand woven cottons from Guatemala, backed with sturdy cotton. Constructed with an exposed brass zipper. Wash and dry cool. Striking variation on a chevron pattern, on cotton. Constructed with an invisible zipper. Wash and dry medium. Bold chevron pattern on sturdy cotton. Constructed with an invisible zipper. Wash and dry medium. Delicate floral print on ivory cotton. Constructed with in invisible zipper. Wash and dry medium. Eye-catching slightly distressed pattern on a heavy textured cotton. Constructed with an invisible zipper. Wash and dry medium. Vintage floral print on a charcoal background, on cotton. Constructed with an invisible zipper. Wash and dry medium.